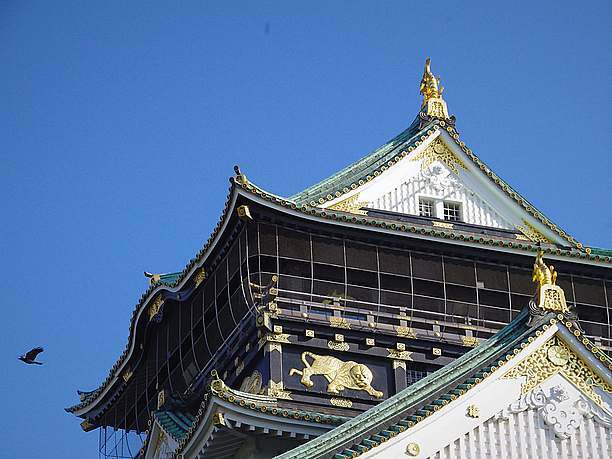 Osaka Castle is exactly in the center of Osaka. 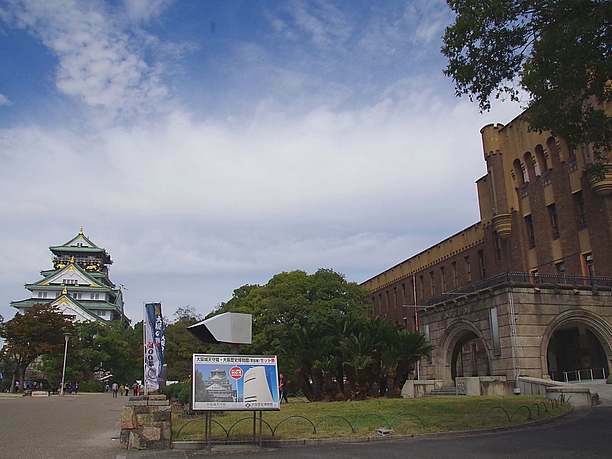 Osaka Castle has been a part of many of the stages of the history of Osaka, and is now one of the main attractions of Osaka sightseeing. Although the castle tower really grabs your attention, there are plenty of places to see other than just the castle tower. It would be unfortunate to pass by the area without knowing about some of the hidden wonders surrounding the castle tower. 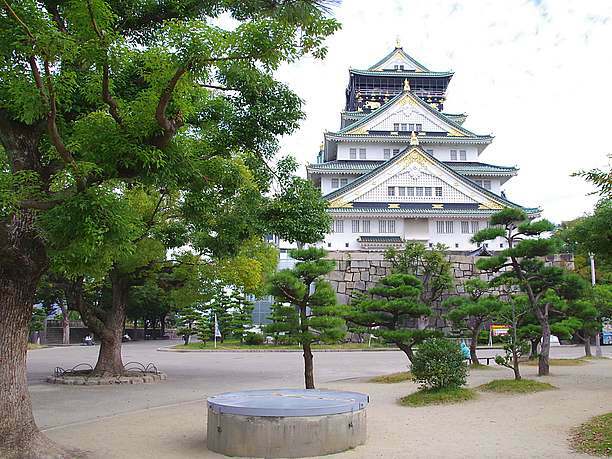 In 1931 the current Osaka castle tower was rebuilt into a park in the Honmaru area. It was constructed as a museum as well as an area for maintenance of the park and military command center. The construction funds for the rebuild came from donations from citizens. After the war, the military headquarters building was used as a police headquarters and municipal museum and still remains in front of the castle tower. Both headquarters were rebuilt with the latest construction methods and the castle tower maintained its classical architectural style. The castle tower has survived through several eras! 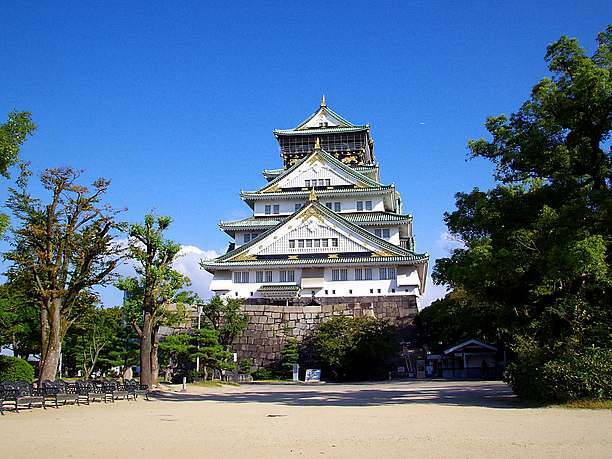 Osaka Castle also called “Taiko-san castle” was originally built by Hideyoshi Toyotomi (豊臣秀吉). After the fall of the Toyotomi era the castle was flattened and buried without a trace by the Tokugawa family (徳川家). The Tokugawa family built a new castle, but it was destroyed by lightning in 1665 and never rebuilt. All that remained was the castle tower and it was reconstruction in the Showa era with the intent to restore the tower to the appearance it had during the Toyotomi era. It was at this time they decided to utilize the interior of the tower as a museum. This castle tower is a registered tangible cultural asset as a building that contributes to the historical landscape. 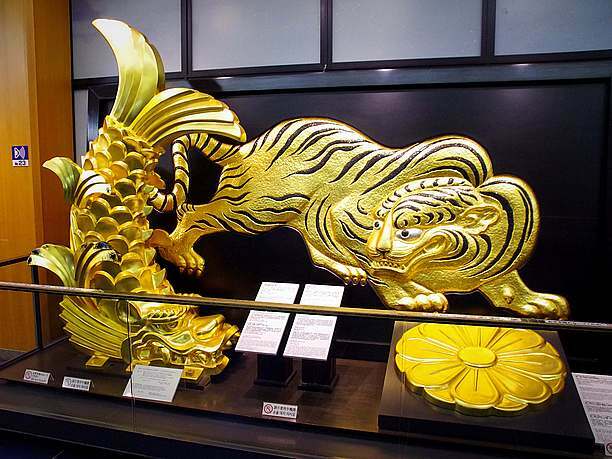 Tiger and crane paintings are drawn on the fifth floor of the castle tower over a gold inlay. Though in the Toyotomi era, it was not a crane but a picture of a heron that was used. From the outside it is difficult to confirm the picture of the crane, but if you go up to the top floor of the castle tower, you can confirm it. 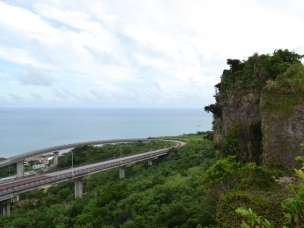 The castle remains from the Toyotomi period were discovered! South of the castle tower, there is a large circular stone cylinder that at first glance appears to be a well. 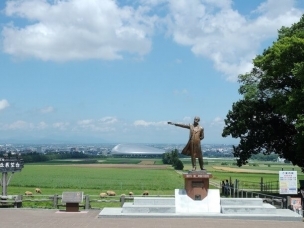 Under it, the stone walls of the castle from the Toyotomi era were hidden! In 1959 when an academic survey was conducted the stone walls were discovered. These traces of the first wall proved that the Tokugawa family had totally removed and buried the castle from the Toyotomi era and rebuilt it as the Osaka Castle of Tokugawa. 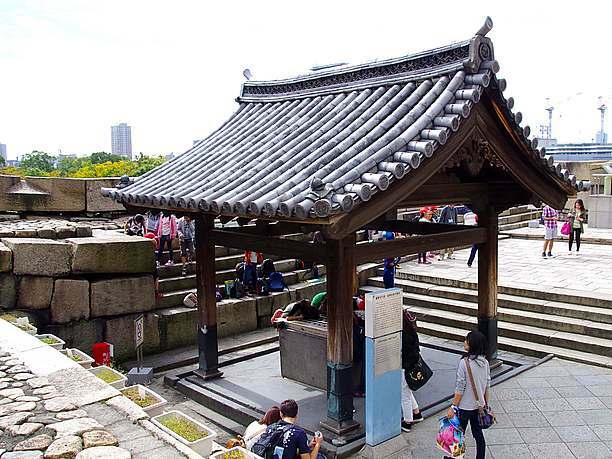 There is also a legendary well that is said to be a place where Hideyoshi sank gold just before the entrance to the castle tower. It is obvious now that what is buried here is not gold but remains of the castle wall. But knowing that the remains from the Toyotomi era are sleeping in the ground, you can’t help but feel the history of this place. Excavation surveys are still being carried out in the surrounding area. A project to unearth the castle stones from the Toyotomi era has also begun! There is a beautiful Japanese garden around the castle tower! 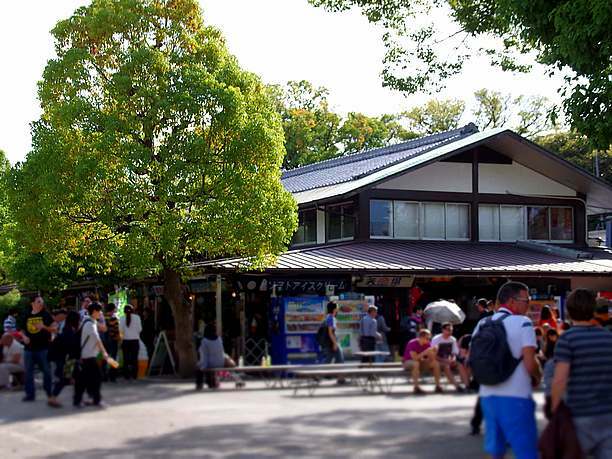 In front of the castle tower, there are souvenir shops that are crowded with tourists. Around the castle there are other attractions to enjoy! Like the beautiful Japanese garden on the west side of the Honmaru area that is a great place to take a break. There is also a place where you can sit in the area around where another castle was located in the Edo period, and ponds that make a good scene for commemorative photography. Tours of Osaka Castle are full of highlights. 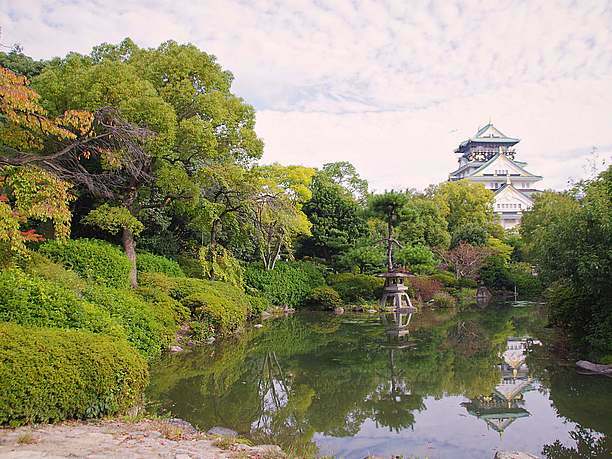 A minimum of a half day is necessary if you want to see everything that is considered important cultural properties in the Osaka Castle Park. If just visiting the castle tower, it usually takes less than an hour to briefly tour. It takes 3-4 hours to look carefully. If you are looking to have a more efficient sightseeing experience, ask a volunteer guide for assistance! 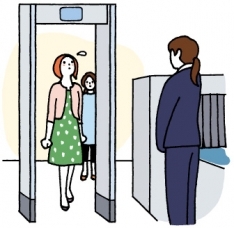 Their office is located at the Toyokuni Shinto shrine in front of Sakura-Mon gate. Tourist peak time is around 9:00 a.m. and around 4:30 p.m. Basically the times the tower first opens and right before it closes are most busy. 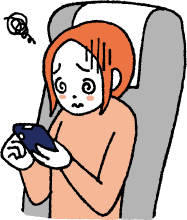 Also, there are many foreign tourists and school trips on weekdays and holidays. The weather does not affect the crowds much! There are some places you can get light snacks in the Honmaru area but there are no restaurants! So, it may be better to bring a lunch and have a picnic. But there are few places where you can avoid rain or sunlight so come prepared. Attraction packed, Osaka Castle! Historic sites, tour of boulders and stone walls on an important cultural property. 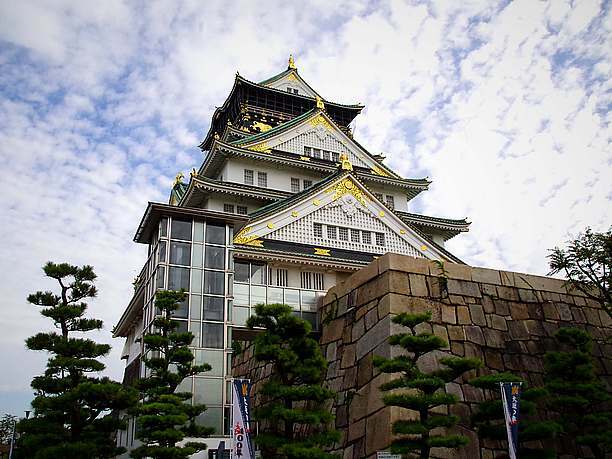 14 sights of Osaka (full of Naniwa charm) not to be missed!